Gender equality has not yet been reached in Gaelic football but winning an All-Ireland has vindicated the huge commitment of inter-county football for DCU’s Fiona Hudson and Aisling Moloney. This year saw the Ladies Gaelic Football Association (LGFA) All Ireland final smash the attendance records of the past and become, by some 11,000 spectators, the highest attended ladies’ final of 2017 across all sports. The pinnacle event of the sport was held in Croke Park and saw Dublin and Mayo battle it out in the senor decider after Derry and Fermanagh and Tipperary and Tyrone contested the Junior and Intermediate titles respectively. Some 46,286 fans attended this year’s final, a huge leap from the then record attendance of 34,445 set last September. Although attendance at LGFA matches and general support for the sport are on an upward curve there is still a large gulf between it and men’s GAA, whose figures are contrastingly falling. To put it into perspective, you would have to go back to 1947 when the All-Ireland final was played in New York for a men’s final to have a smaller attendance than this year’s record breaking ladies’ final attendance. 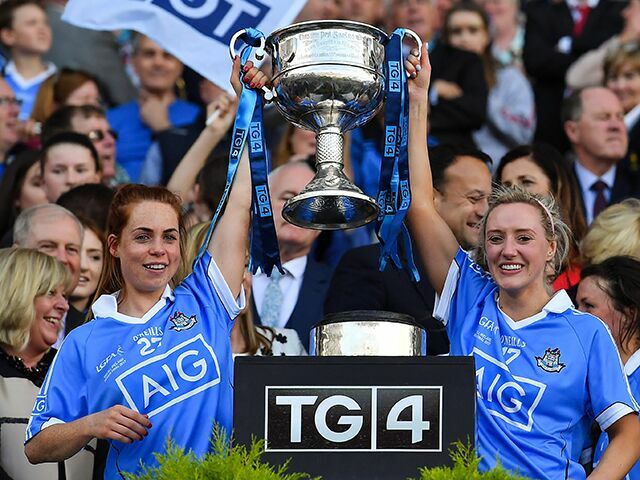 This year’s final attendance is promising for the growth of the sport but Dublin footballer and DCU access officer Fiona Hudson feels that the support needs to come not just on the final day but for every LGFA game. “It is always great to see such a big crowd in Croke Park supporting the ladies, the support has grown over the years and I think it will continue to do so,” she said. “There was great hype and media coverage this year for the finals but I do think this needs to be the case with all ladies’ games, not just for All Ireland Final day.” This opinion almost exactly mirrored that of Aisling Moloney, Tipperary footballer and DCU student. “In the build up to the All-Ireland final, the senior final in particular, there was so much on social media about it,” she added. However, she was still critical of the amount of faces she sees on game day, as opposed to online. “People are supporting it, but they’re not actually going to the games,” she continued. This year a “proper fan” campaign was run whereby supporters of Gaelic football were implored the follow LGFA and not just GAA. The campaign was extremely successful in giving attention to ladies Gaelic football with thousands tweeting the tag #properfan. According to Moroney this played a “massive role” in the rising attendances at ladies gaelic football games, along with TG4 and Lidl, who both Moroney and Hudson praised for their ongoing support. A story has emerged about the Dublin ladies football team having to raise their own funds for their team holiday and it appears that there is a lack of equality between the two genders within the sport. “Although we’re trying for change and we have got a lot of change, WGPA have made a lot of difference to us, but obviously the men are going the have more perks than the girls,” Moloney stated. The commitment shown by the women involved in the sport is no lesser than that shown by the men, this commitment is however a given for Moloney. “Well, we train three times a week and then what ever club you fit in in between that but I suppose I’ve grown into a GAA family where I know no difference,” she said. For Hudson, the ends justifies the means of this commitment and the results of her hard work sufficed as a payback. “It is a very special time for Dublin LGFA,” she reflected. As support for LGFA continues to improve, Hudson is confident that the gap between LGFA and GAA will be narrowed. “The calibre of players across all the finals really did match what you’d see in Croke Park the third week in September” she concluded.